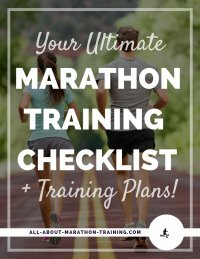 If you choose marathon running shoes that fit poorly, you are setting yourself up for risk of injury. I remember training for my first marathon in a pair of stark white Reeboks. Sounds good? It wasn't. They were super high heeled aerobic shoes with no bounce or flexibility to them. It was with these marathon training shoes (if you want to even call them that) that I experienced my first black toenail! I know better now. My dad took me shopping for new shoes a couple weeks before my first marathon. I picked out some (what I thought I the time) were snazzy green Champion trainers and ran an injury free race. Thinking back I know I should count my blessings. I could have received a lot worse than a runners toe! As you can see these shoes are debating amongst themselves on which is the best, which will carry their runner the farthest and fastest. Don't become overwhelmed by all the different opinions you will get from other runners! You are on a quest for the best shoe for YOU! And a poor pair of shoes will only lead to discomfort, frustration and injury. Achilles Tendonitis - This is an inflammation of the Achilles tendon. Shoes with inflexible and rigid soles can cause this since they make the calves work harder then they are supposed to. To adress this problem choose a shoe that has a slightly higher heel, more flexibility in the sole and good heel stability. Plantar Fasciitis - (or heel pain) is caused by too much flexibility in the mid-sole and therefore stretch the plantar fasciitis (which is located on the underside of your foot). With this foot problem you need to find a shoe that offers more stability and should fit your heel while keeping it snug and not allowing the heel to roll. Knee Pain- Knee pains that are caused by running shoes are usually due to your ankle joints twisting and moving too much. To help alleviat this problem you need to get a pair of running shoes with plenty of cushion, stability but some flexibility. Shin Splits - Shin splits can be very painful but a good running shoe can help solve the problem. Look for a stable shoe with moderate amount of cushion. Runners Toe - a more of an annoying toe situation, that causes discoloration, soreness, mild pain and can eventually lead to your nail falling off. Muscle Soreness - if you have noticed an increase in muscle soreness it may be due to your running shoes. A poor fitting shoe and improper form due to an ill-fit will cause this enhanced soreness. Read this section on shopping for a running shoe. There are some great tips that will make you aware of what to look for and what to avoid. Keep in mind that the more cushion your shoe has the less amount of stability it offers. If you are experiencing chronic pain and injury, I strongly, strongly suggest re-evaulating your shoes and transitioning to more minimalist running shoes. Shop Our Running Shoe Store!